The UN General Assembly this year celebrated its 70th anniversary which is why more leaders than usual attended and participated. While the speeches were typical and mostly irrelevant for people already well-informed about world events, there was one particular point to note that made this gathering more telling than most. It wasn’t a point that could be discerned by simply watching the speeches play out on the floor of the General Assembly hall, but rather revealed itself in the reaction to the speeches by American policymakers online. While they predictably railed against the speech presented by Russian President Vladimir Putin, they also derided US President Barack Obama for being upstaged by his Russian counterpart. But it wasn’t President Obama’s shortcomings nor that of his speechwriters that led to this apparent humiliation. It was American policy itself, owed to the very policymakers being derisive. The fact that a Democratic US president expanded the wars of his Republican predecessor, and provoked those this Republican opponents failed to implement during their term, illustrates perfectly the continuity of agenda prevalent in Western politics. Like the US often accuses its competitors around the world, the United States itself is ruled by an oligarchy of special interests who simply dress up their singular agenda as partisan politics to maintain the illusion of representative governance.Their wars which in reality serve the singular purpose of achieving and maintaining global geopolitical socioeconomic hegemony are dressed up as “defending the homeland” under Republicans, and “humanitarian interventions” under Democrats. In following the unwarranted wealth and influence wrought from such wars, it can be seen clearly for what purpose they are truly waged. Thus, the criticism from across American foreign policy circles in the wake of the UN General Assembly, reveals precisely where America’s true problems lie. 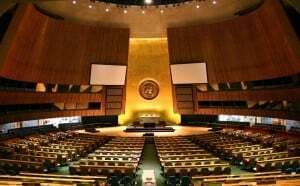 It was their policy that President Obama was attempting to present to the world at the UN General Assembly. President Obama wasn’t upstaged because he is a poor orator or because he depends on incompetent speechwriters, but because nothing the United States is truly doing around the world could be honestly presented to the public, leaving only the same tired rhetoric and boundless hypocrisy that even the least observant among us are beginning to notice.This can best be illustrated in Syria, where the United States claims to be committed to defeating terrorism, all while it transparently supports terrorist militants in its goal to overthrow the government in Damascus. Thus, President Obama’s talking points during the UN General Assembly regarding Syria rang particularly hollow. Conversely, when Russia stated that it planned to defeat terrorism in Syria, the world could already see clearly that it has been Russia supporting the only force within Syria’s borders confronting terrorism – the government in Damascus. American policymakers don’t appear to realize or at least be willing to accept that it is they and the special interests they serve that are responsible for America’s decline, its unpopularity, and the rise of competitors able to upstage the US in front of the UN General Assembly, and upon the stage of geopolitics. These policymakers responsible for America’s current course will never admit that they are not as smart as they believe themselves to be, or that their poor judgement, petty ambitions, egos, and plain incompetence has led to this irreparable decline in American legitimacy and influence. And because they can never admit it, they can do nothing to resolve it. But maybe that is for the better.